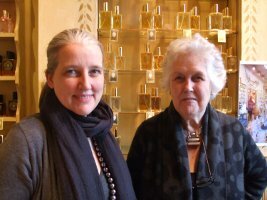 Perfume-shopping in London is really all about the West End (the shopping/theatre areas west of the City). The East End, despite recent trendification, is not the place you’d expect to find much in the way of good perfume hunting. However, it’s worth making the trip east to visit the Angela Flanders shop, established in Shoreditch in 1985, where she sells her own creations in a charming boutique. It’s a bit like the East End equivalent of Ormonde Jayne. There’s one catch: the shop is only open on Sundays. At any other time, you have to make an appointment. The reason for this becomes clear if you visit the area. The shop is on Columbia Road, where there’s a famous flower market every Sunday. For the rest of the week, it’s a quiet residential area, but on Sundays the place is crammed to bursting with people who’ve come here for bouquets and plants (often cycling away with the flowers in the baskets of their bikes). Inside the boutique, there’s a main room displaying perfumes, skincare items, candles and home fragrances, and a back parlour offering shelves of essential oils and some sniffing space. The perfumes are sold in simple square bottles, and come in 100 ml Eau de Toilette, 50 ml Eau de Parfum, and some in 30 ml Concentration Forte. There are also bath products and lotions. Samples are readily available. Items are nicely packaged in bronze tissue and black ribboned bags. Candles come in gold boxes. 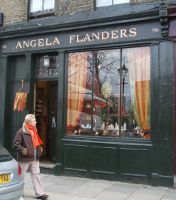 Details: Angela Flanders, 96 Columbia Road, Shoreditch, London E2 7QB. Open Sundays 9 am - 3 pm. Getting there: Nearest tube stations are Bethnal Green (Central Line) and Old Street (Northern Line), both about 15 minutes’ walk. Nearby: The Columbia Road market, open Sundays 8 am – late afternoon. Brick Lane (known as ‘Banglatown’ on account of its large Bangladeshi population) is nearby and worth a visit; the Brick Lane Market is also open on Sundays from 8 am.